While environmental health campaigns encourage smoke-free lifestyle and environments, not many people are aware of the actual risks associated with smoking and second-hand smoke exposure. It’s important to understand that volatile organic compounds (VOCs) in cigarette smoke lead to low air quality and poor health outcomes. VOCs can be found in numerous settings, especially in homes. Such chemicals can get trapped in buildings and affect the environment as well as people’s health. In fact, compounds like methylene chloride are extremely toxic and can become lethal. Many clinical studies, which can be found on PubMed*, focus on VOC concentrations in cigarette smoke, in particular, and reveal that smoking can increase the levels of carcinogenic polycyclic aromatic hydrocarbons in lung tissue. Note that PubMed is one of the most efficient free search engines which contain thousands of scientific articles. Experts claim that an indoor air quality monitor can be an effective tool in the detection of dangerous chemical concentrations and health risks. Cigarette smoking and VOCs: Cigarettes smoke is a complex chemical composition and a primary source of dangerous chemicals, such as benzene, styrene, ethylbenzene, toluene, and xylenes. Exploring the literature available through PubMed can lead to some alarming insights. To be more precise, it’s been proven that there are more than 7,000 toxic substances identified in cigarette smoke. Adverse effects: Volatile organic compounds in cigarette smoke have been linked to an increased risk of cancer and lung disease. Note that lung cancer is the leading cause of cancer death. Exposure to tobacco smoke can lead to other problems, such as skin irritation, sore throat, headaches, memory problems, and nausea. Passive smoking: Exposure to second-hand smoke is also dangerous. The World Health Organization claims that second-hand exposure is the most common exposure to pollutants indoors. In addition, the US Environmental Protection Agency warns that passive smoking, especially in kids, can lead to lung cancer and respiratory diseases. Burning candles: Scented candles, which are used to reduce cigarette smoke odor, can also become a source of toxic compounds. Numerous studies published in scientific journals like the Regulatory Toxicology and Pharmacology (Regul Toxicol Pharma) and across platforms like PubMed can provide more information on the topic. 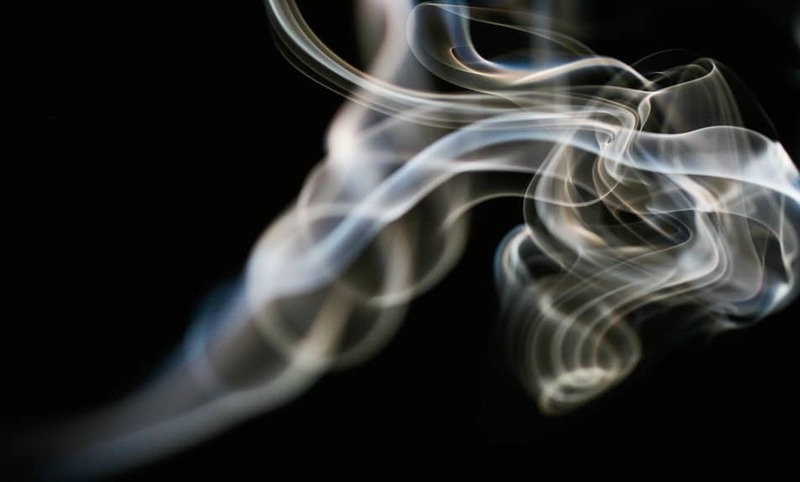 Environmental concerns: Cigarette smoke exposure has a severe effect not only on the indoor air quality of the building and its occupants but the environment as a whole. In fact, smoke in general is classified as an anthropogenic aerosol which can harm the ozone layer of the Earth. While nicotine is addictive, smoking is hazardous itself. Therefore - from nicotine gums to aerosols - there are many alternatives which can help people quit. Vaping and e-cigarettes, in particular, have become extremely popular. Nevertheless, studies show that electronic cigarette emissions are also hazardous. Electronic cigarette aerosols include (more often than not) nicotine, propylene glycol, and numerous pollutants like dangerous VOCs (e.g. benzene). What’s more, researchers claim that contrary to popular belief, menthol-flavored e-cigs do not have safer concentrations of aerosol particles. Vaping indoors, especially around kids, is not recommended. That said, it is likely that vaping is much less harmful than smoking, due to the absence of combustion and therefore, the absence of particulate matters. In all cases, good ventilation after vaping is essential to air out smoke.